Stan Wawrinka ousted the 3 time defending champion Novak Djokovic in an epic 5 setter battle 6-2, 4-6, 2-6, 6-3, 9-7 in exactly four hours time to reach the semi-finals of Australian Open, 2014 where he will play the 7th seeded Tomas Berdych on Thursday. 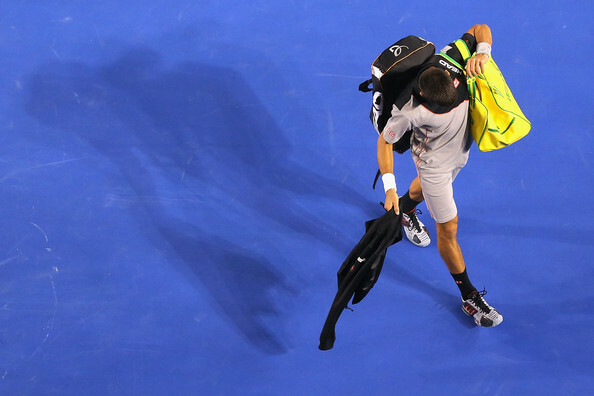 This was Novak Djokovic's first loss after US Open final 2013, winning streak that saw him winning 28 matches. Wawrinka reached his second successive grand slam semi-final while Novak Djokovic's streak of 14 successive Grand slam finals got broken today (Roger Federer holds the record of 23 successive grand slam semi-finals). In what can be called as destiny's turnaround, last year, these two had played an epic 5 setter, 4th Round that lasted 5 hours & 2 minutes and had finished at 1:48 am on 21st January, 2013. Last year, Wawrinka not only lost the above mentioned Aus Open 4th Round match vs Djokovic, but also had lost to Djokovic in the semi-finals of US Open in a tough 5 setter in September, 2013. The match was a complete reversal of that epic 4th Round match of last year. 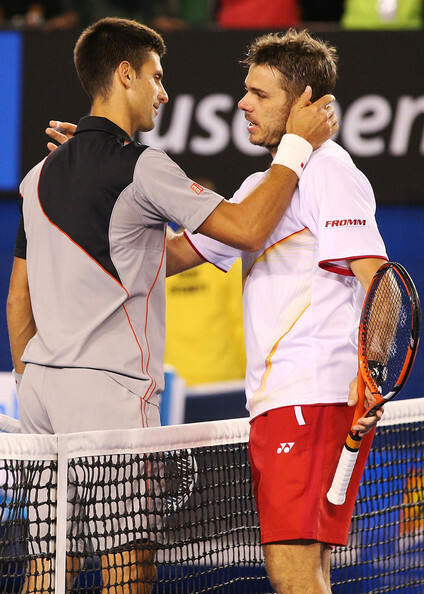 This was Wawrinka's 3rd match win vs Djokovic in 18 matches & came after Djokovic won 14 successive matches against him. 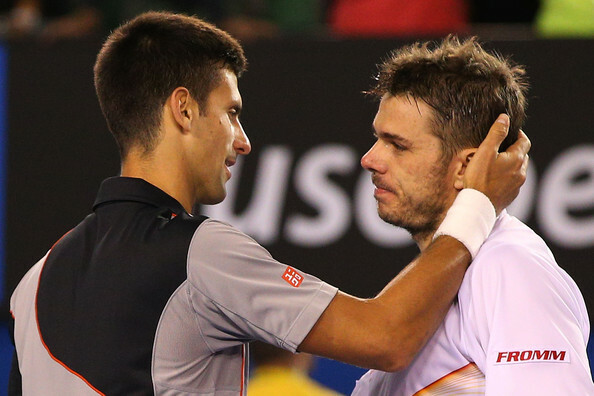 If last year, Wawrinka had dominated the first set, this year, Djokovic looked sharp & relentless in the first set. He broke Wawrinka's service in the 6th & 8th game to win the 1st set 6-2 in just 31 minutes. 2nd set saw a more aggressive Wawrinka as he had three break points in the 3rd game, which Djokovic saved, but, Wawrinka got his first break in the 7th game & that break proved sufficient as Wawrinka wrapped up the set 6-4 in 45 minutes. 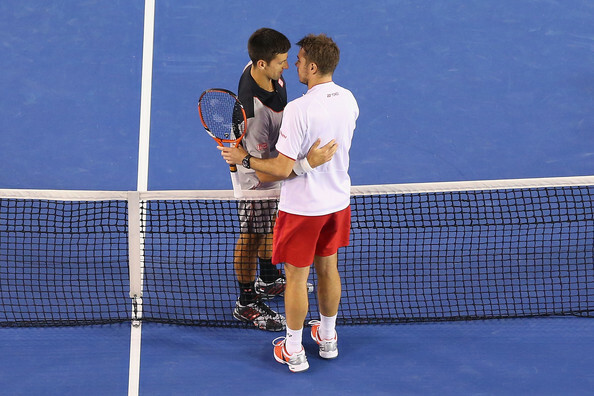 Wawrinka carried on the momentum and some heavy hitting as he broke Djokovic's service in the 3rd & 5th game. Wawrinka just like the 2nd set didn't face a break point on his service & wrapped up the set 6-2 in 36 minutes to get to a 2-1 set lead. 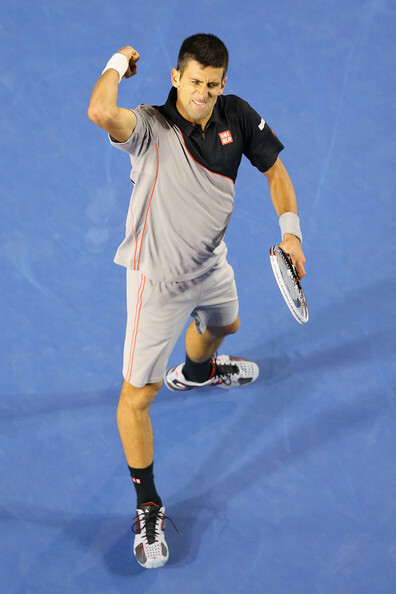 4th set saw the revival of the four time champion Novak Djokovic. Not only did the Serb's service improved, he was able to put consistent pressure on the Swiss No. 2 service's. Wawrinka lead 40-0 in the 8th game while serving at 3-4, how ever, Djokovic broke Wawrinka's service as a result of some fine returns & couple of great volleys to get to a 5-3 lead. The No.2 seed then held his service in the 9th game to win the 4th set 6-3 in 49 minutes & it was 2-set all. The defending champion had all the momentum & managed to break Wawrinka's service in the 3rd game. Just as it looked as if Djokovic is the clear favorite from here on, Wawrinka got the break back and it was 2-all. 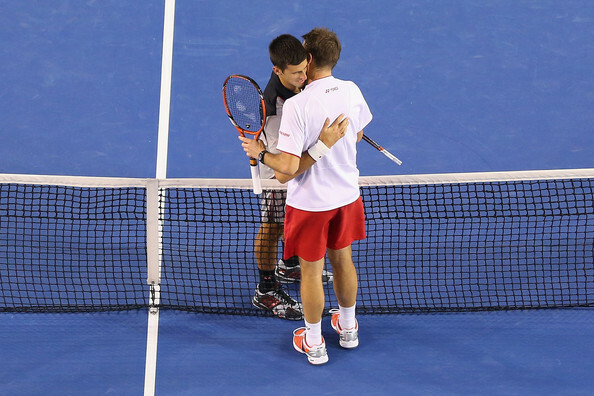 Djokovic again had a break point in the 5th game, but Wawrinka managed to save it. In the 7th game, Wawrinka served his 14th ace of the match & his fastest service of the match that measured 219kmph on the speed gun. 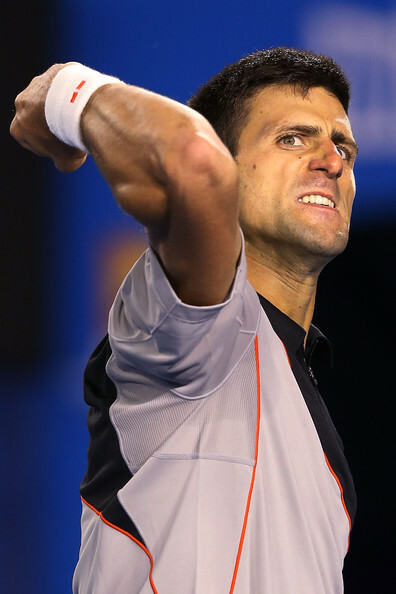 Djokovic clearly was looking frustrated & was looking at his box again & again. In the 11th game on Wawrinka's service, it began to rain as he complained to the chair umpire. The play was held as Wawrinka was up 40-15 with his 1st service being fault. The rain break lasted 4 minutes as Wawrinka held his service to make it 6-5. The next 4 service games went on service. In the 16th game, Djokovic serving down 7-8 made two errors as he was down 15-40, he tried to serve & volley, but how ever his backhand volley went out & Wawrinka went on to win the set 9-7 & the match in exactly 4 hours. The key to the match for Wawrinka was his fine serving, even though his first serve % was only 58%, but, still he won 72% of those points & also, the fact that he faced only 7 break pints inspite of Djokovic being regarded as one of the best service returners of the game. This victory means that, Stan Wawrinka for the first time in over a decade will become the Number 1 ranked Swiss player unless Roger Federer reaches the finals of Australian Open, 2014. For more ranking scenarios post Australian Open, 2014, click here. Scroll down for more pictures, video highlights, detailed analysis, insights, on court interview of Wawrinka by Jim Courier & post match press conferences of both players. Stan speaking to the umpire after rain started to fall..
Wawrinka: "Last year I finished it was really tough but this year I came back it was a new year," he said. "I tried everything. He's an amazing champion. He never gives up. I'm really, really ... really happy. I cannot just let the match goes, you know. I don't want to lose every time in five set against Novak. I had to find solution. I had to fight within myself to fight against him.Tonight I'm going to enjoy with the victory of today because I think it's important. That's why I play well last year, because I'm enjoying my life, I'm enjoying the tennis." "He showed his mental strength and he deserved to win,the only thing I can say is congratulations." Q. Where do you feel the difference was tonight? 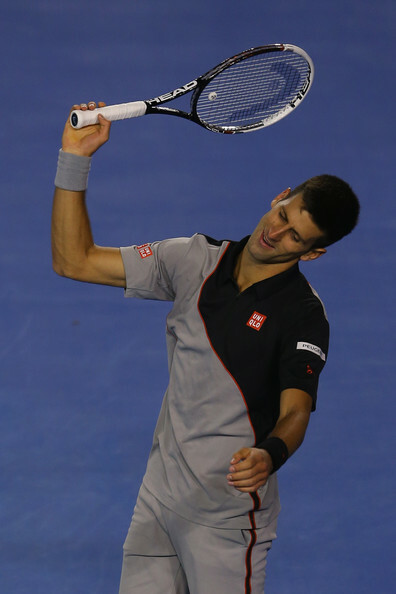 NOVAK DJOKOVIC: Well, I think it was quite even. From the start I played better. Had some opportunities early in the second to get the break, and I didn't use that. He served extremely well from the beginning to the end. Every time he was in trouble, he was coming up with big serves. You know, he took his opportunities. He deserved this win today. I congratulate him absolutely. There is nothing I can say. You know, I gave it my best. I gave it all. I tried to, you know, come out as the winner. I tried to fight till the last point as I did in a very similar match we did last year fourth round, same court, but it wasn't to be this time. Q. What about the way the match ended? Must be disappointing. NOVAK DJOKOVIC: Yes, unfortunately. But, you know, I mean, look, I can say I was lucky with some shots last year in our match. This time it was him that had luck a little bit on 30 All, this miss hit return. Then an easy volley for me on a match point. But this is sport. You know, I mean, he showed his mental strength and he deserved to win. Q. How wary were you about playing him again? 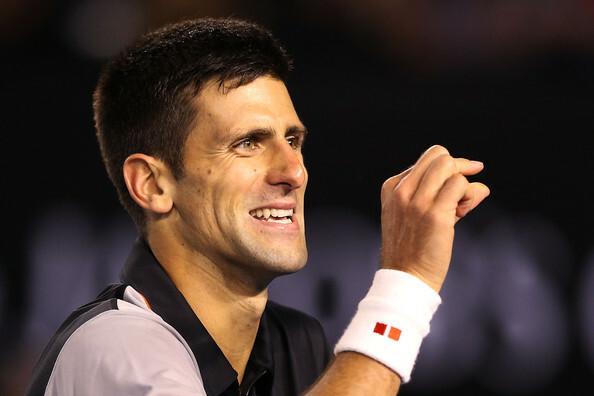 NOVAK DJOKOVIC: Well, he's in a great form. In the last 15 months he's had the best results. He's established now in top 10. He's been winning against top players in big tournaments. He won against Murray in US Open last year. So he knows how to play now on the big stage. You could feel that with his game. He's really taking to the opponent and stepping in. When you're playing like this, only thing I can say is congratulations. Q. You've had epic battles on that court the last few years. What's going through your head when you're out there on that court? NOVAK DJOKOVIC: Yeah, it's amazing court, probably the court where I had most excitement in my tennis career throughout all my career. I mean, matches with Rafa, with Stan, last year, this year, some epic battles. Won many trophies in Australia, Rod Laver Arena. I mean, I love that court. These are kind of matches that you work for, you live for, you practice for. You know, unfortunately somebody has to lose in the end. This year was me. I lost to a better player. Q. Because of your history in five setters here, did you think going into this fifth set, did you feel confident? NOVAK DJOKOVIC: Yes, I did. I did feel confident. I mean, I started great. I made a break on 1 All in the fifth, and then I played a poor game, four forehand errors. From the far end it was more difficult to play because you play against the wind. So most of the breaks were happening in the closer end. That's where he won this match. But still, it was very even and we both served well. Then, you know, in the end, couple of lucky shots and mistakes from my side decided the match. Q. Sometimes you were watching Boris and your coach team trying to understand what was going on maybe? 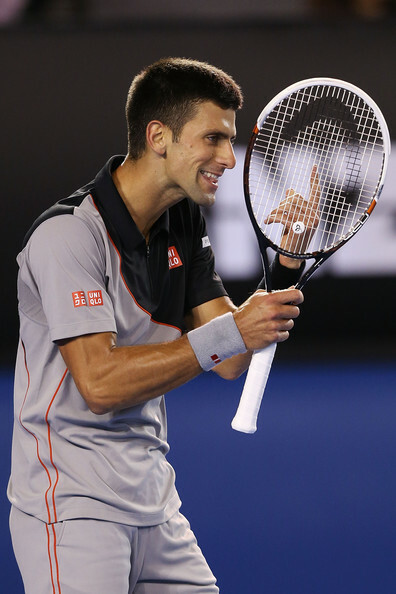 NOVAK DJOKOVIC: I mean, I go through my emotions in the match. It's not the first time. I've been doing that in the past. Q. 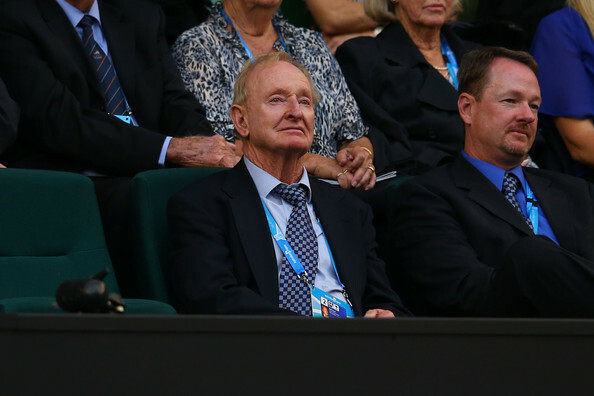 Will tonight influence your decision regarding the Davis Cup next week? NOVAK DJOKOVIC: I'll see. It's too early yet. I just came off the court. I'll decide in next few days. Q. In a game where there was so little between you and Stan, what do you take out of it going forward? NOVAK DJOKOVIC: Well, I mean, of course obviously I'm disappointed, you know, at this stage. But tomorrow is a new day. I have to accept the facts that, you know, you can't win all the matches that you play on. One thing I can be proud of is that I gave my best. It wasn't enough. But, again, I know that I fight all the way through and laid my heart out there. It's a battle. One of us has to lose. He was, as I said, a better player. He stepped in and he won the match. On the other hand, you know, these are the positives that I can take, as I previously said. Now, you know, it's only the start of the season, so I'm going to see what I'm going to do next and take it from there. Q. Now is Wawrinka able to win the tournament or would it be a huge surprise for you? 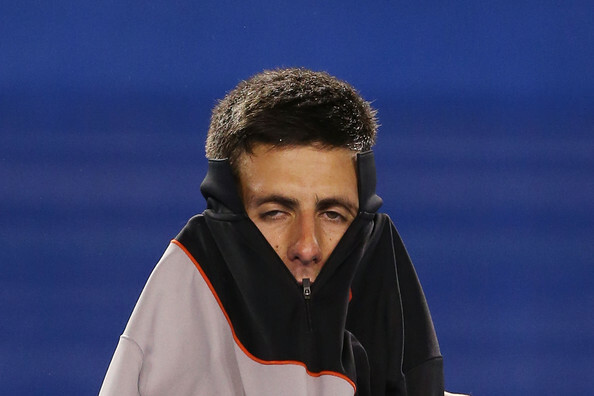 NOVAK DJOKOVIC: I don't know. It's not a huge surprise, because, as I said, he's already feeling much more confident in the last year, year and a half. With his performances on the big tournaments, you can say that he deserves to be where he is. You know, he deserves to win this match tonight because he's a great player and he's mentally matured and that's it. If he's going to win or not, I don't know. Every day is different. Q. How do you sum up your work with Boris here? NOVAK DJOKOVIC: Well, look, you know, it's been the first official tournament for us. I'm satisfied with things that we've been talking about, working on. Of course, it's unfortunate that we finished the tournament in quarterfinals. But look, you know, as I said, it's beginning of the season and we'll see what's coming next. Q. Your winning streak, at some point it would have had to have ended. Did you ever think about how it would end? NOVAK DJOKOVIC: No. I don't try to think about the outcomes of the matches or streaks. I have the experience of playing on this level for many years. That has helped me to have the positive mental approach to everything. I just influence, you know, what I can, and that is what I can do on the court, to be in the present moment. That's how I'm playing tennis today. You know, as long as I'm mentally so clear in my mind and as long as I have motivation to play this sport, this is the way it's going to be. Q. Physically how did this compare to the last two five setters you played against him? NOVAK DJOKOVIC: Physically I'm all right, you know. It was a tough battle mentally, physically, emotionally obviously. This is what happens when you play a top player on this stage, when you go the distance in the fifth. Of course, you know, after playing four hours you are a little bit exhausted, but I do not feel, you know, too exhausted. I could have played for a while. Q. Less taxing physically than here last year with him? NOVAK DJOKOVIC: Last year was also a big battle. Maybe the court was a bit slower so we played more, I would say, rallies, more exchanges than this year. Q. Can you talk through your decision to serve and volley on match point. NOVAK DJOKOVIC: Well, he's been blocking my serve. He's been chipping the return for the whole match basically. And it was actually a good decision. I had a good serve and volley and good volley, but didn't put it away. Q. You leave with a 25 match winning streak in Melbourne. How proud are you of what you've accomplished at this tournament? NOVAK DJOKOVIC: Well, I have to be very proud of my accomplishments in my whole career, and especially in this tournament. This is definitely by far the most successful Grand Slam that I have. I've been enjoying Australia, enjoying the support here and the conditions. I can't wait to come back next year. Q. Did the faster conditions hurt your chances this year? NOVAK DJOKOVIC: I got used to it. At the start it was of course a little bit different for players to get used to the faster conditions. But after two matches I was ready, feeling well on the court, and comfortable. Q. Nobody beats Wawrinka 15 times in a row. STANISLAS WAWRINKA: 14 is already enough (smiling). Q. What is the feeling you have right now? How different from last year? STANISLAS WAWRINKA: It's completely different, for sure. I'm really happy. I'm excited. Yeah, it was more or less the same feeling during the match than last year. The beginning was not that easy, but then I start to play really well. It was important to stay with me. Yeah, after losing two times against him in Grand Slam in five sets, I'm really happy to take that one. It's great for me. Q. Could you explain the emotions of the fifth set. Serving first was an advantage. STANISLAS WAWRINKA: I think it's an advantage to serve first. But I get broken I think at 1 1, something like that. When I break back, I had the feeling that I had to go to take my chance. I had to stay really aggressive. I had to push him a lot, because to be ahead in the score, it's always an advantage, especially here when it's quite fast and windy condition. Yeah, it was a really tough battle. I start to cramp a little bit middle of fifth set, so I had to deal with that. I had to relax a little bit more. I was returning well. I had to do more with my serve, mixing more, and stay really aggressive. Didn't want to let him win that one. Get a little bit lucky in the last one. He missed easy shots. But in general in the fifth set I think I went for it. Q. Is this the most significant win of your career? STANISLAS WAWRINKA: Yeah, one of for sure. Yeah, he's so tough to beat. He's amazing champion. He's always fight. He's always find solution. In the fourth set I think I was playing good and he won that set. So was not easy to deal with that in the fifth set, especially against him. Last time he find always solution against me in the fifth set. He was better player. But, yeah, not tonight. Again, I think I won that match because I really, really tried to find solutions tonight. Q. You're playing in the era with all these great players. Talk about what it's been like for quite a while to have all these tough losses. STANISLAS WAWRINKA: Well, I think for sure it's a really, really strong generation. The top four guys, Roger, Novak, Rafa, Andy. They have been winning every Grand Slam since many, many years. They are just better player than us, than all the rest. They are just amazing fighter, amazing player. That's why they always won everything. You have to deal with that. You have to fight. I know that the only thing I can control is what I'm doing off the court: my practice, how I do my schedule. I always try to improve. I always try to find solution to change my game a little bit, to improve, to find solution when I play against the top player. It's never easy. I have so many loss against them, it's always a tough challenge to play them. But, you know, I think last year I took a lot of confidence with those match with Novak. Was really close. I was playing good. We always have some great battle. I came on the court tonight with a lot of confidence on myself, knowing that if I play my best game, I always have a chance against him. Q. In the fourth set you were up two sets to one and a break. STANISLAS WAWRINKA: I had a break in the fourth (smiling)? No. Q. Oh, okay. How difficult was it to come back in the fifth set knowing your history of the past two Grand Slams? STANISLAS WAWRINKA: It's always tough, especially against Novak. You know that he's going to play even better. I cannot just let the match goes, you know. I don't want to lose every time in five set against Novak. I had to find solution. I had to fight within myself to fight against him and try to keep my line during the game. That's mean being really aggressive, serve better. That's what I did. That's why I won the match tonight. Q. 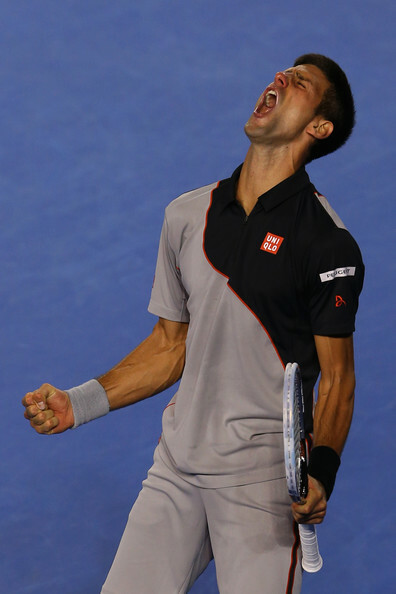 How much does reaching consecutive Grand Slam semifinals mean to you? STANISLAS WAWRINKA: It's amazing. I'm enjoying for sure because I'm playing great tennis. Yeah, it's a different level if I compare to last year here. I had a lot of great match, a lot of good result. Now I'm No. 8 in the world. I'm making my second semifinal. Beating Novak here for me, for sure it's great. Still amazing. Q. Do you think you can win this tournament? STANISLAS WAWRINKA: I'm still far from winning the tournament. Two matches, the more difficult matches. But I'm not thinking at all about that, to be honest. I'm thinking match after match. Tonight I'm going to enjoy with the victory of today because I think it's important. That's why I play well last year, because I'm enjoying my life, I'm enjoying the tennis. When I win, it's important, yeah, to be just happy, because I know it's not going to be every Grand Slam that I'm going to be in the semifinals. I just want to enjoy. Tomorrow I will get ready for the semifinal against Tomas Berdych. Q. Considering that you are already in the semifinal versus Berdych that you beat the last three times, and then Federer has to beat before Murray and eventually Nadal. Do you think that is the first time that you, as a Swiss, you are more favorite than Federer in a slam? STANISLAS WAWRINKA: No, I don't think so. I don't think so. We all know that if Roger is playing his best tennis, he can beat everybody here. Me, it's not the case. I have to play my best tennis. I have to hope that Novak is not in his best form or Rafa is not in his best form or Roger is not in his best form. It's completely different. Really, I don't care. Roger, I saw him against Tsonga. I think he was playing really good. But now I'm going to look his match tomorrow. I hope he's going to stay with that level and come back strong this year. Q. He said that you've mentally matured as a player. Has it been a process in the last 18 months? STANISLAS WAWRINKA: Yeah, it start since many years, but especially last year I had a big jump with that. I trust myself when I go on court. I know that I can beat those player. I try everything to beat them. Even when I loss, I go back to practice to try to improve. That's my line in general in my tennis career, so I will keep going and doing the same things. Q. Is it hard to bounce back after an emotional win like this? STANISLAS WAWRINKA: No, I don't think so. I think the most important is I will be ready physically because I'm quite tired right now. It was a tough battle. But mentally I'm going to be ready, for sure. I'm happy to be here. I'm enjoying. I'm playing good tennis. There is no sign that I'm not going to play well the semifinal. Q. How has Magnus helped your game and do you enjoy working with him? STANISLAS WAWRINKA: Yeah, we start up last year. We did some amazing result already together. Second semifinal with him. He's there. He's pushing me every day in practice court before and after match. He's a great guy and really good coach. So far we are enjoying working together. Q. Novak had the longest streak of making slam semifinals with 14 before tonight. You protected Roger's record. Q. But also now you have the longest active streak of making semis, only two, but longer than anybody else right now. Do you expect a 'thank you' from Roger for protecting his record? STANISLAS WAWRINKA: No, no, I think Roger is really happy that I won tonight. I'm sure he watch the match. Maybe not all the match because was a long one, but he is my first supporter. He always text me after the match and is always happy for me. Q. Did you get the sense from the crowd that there was good crowd support for you and that could manifest in a semifinal against Berdych? STANISLAS WAWRINKA: Yeah, maybe. I hope. I'm enjoying to play here on Rod Laver. Tonight was a great crowd. I think since last year I start to have more supporter in every tournament. That's something really important. I'm enjoying to play in front of those people. Q. Have you switched on your phone or watched your Twitter account? STANISLAS WAWRINKA: A little bit during the ice bath. STANISLAS WAWRINKA: Yeah, a little bit too much. That's okay. That's good. That's positive. For sure when you win, you have so many message. Q. They say this surface is a little faster this year. Do you think this was a little advantage for you or not? STANISLAS WAWRINKA: No, I don't think the surface was an advantage for me, because last year it was more similar, little bit faster. Last time I played Novak was London indoor. Normally he is better player. I don't think the surface was a big deal. Q. What did you think when it started to rain? STANISLAS WAWRINKA: Was tough. I was hoping that was not a big rain, you know. After two minutes, was fine. So was okay. I just tried to stay focus on my service game. Q. Do you look at this as a big opportunity now? The fact you're playing Berdych, someone you have beaten, how big a chance do you see now? STANISLAS WAWRINKA: Well, it's for sure a big chance. You know, Berdych is playing well since the beginning of the tournament. He's going to be a tough player to beat. He already made one final in one slam. He already made semifinal in every Grand Slam. So he's there. He's really close from the top, top guy. It's going to be a tough battle, you know. Last time I made semis at US Open I played against Novak. Was a five set match. No, no, doesn't change for me to play Berdych or Roger or Rafa. I just take match after match and try to win and try my best. yupppiiieeeee thats great!!! HAPPY FOR STAN!!! Excellent result for Stan, especially after the disappointment of last year. Richly deserved, a sweet victory! 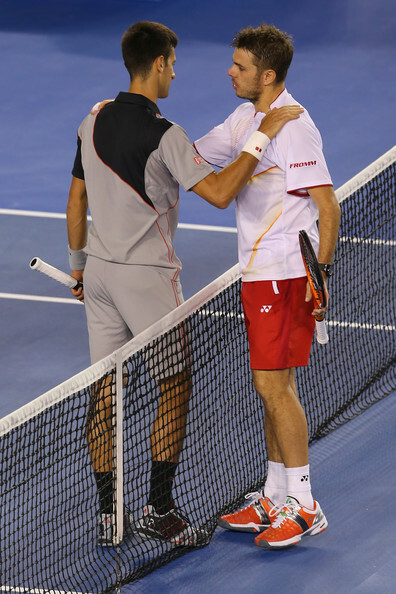 Everytime these two meet at a Grand Slam, its epic! Great victory for Stan! 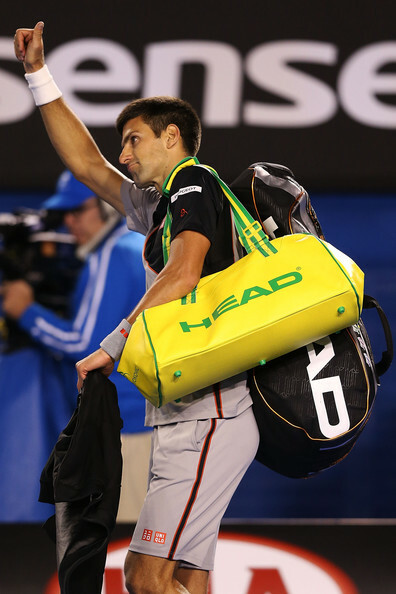 Djokovic's winning streak in Australia and in general both came to an end. I think Nadal is just as happy now as Stan himself, by the way.